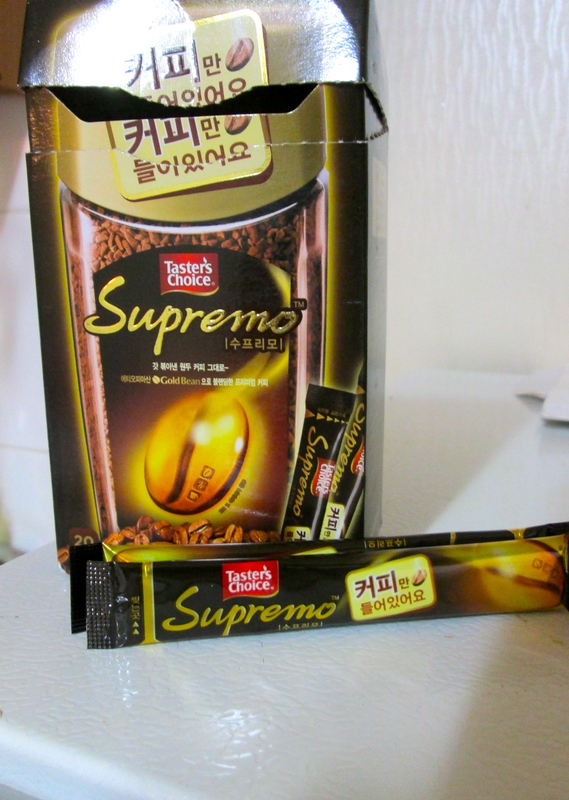 My days in Korea are filled with school, Skype sessions home, and more school. So, I was very much looking forward to a week of new sites and experiences. Luckily, if there is any word to describe my time in China, it would be new. Completely novel,unique, unfamiliar and – at times – baffling. In eight days I saw four different cities, took a flight, and spent a night on a train in the countryside. It would be impossible to share every moment so I’ll settle for recounting my most memorable parts of the trip in a new series called The Best of China. There will be a new post about my trip every week in August. 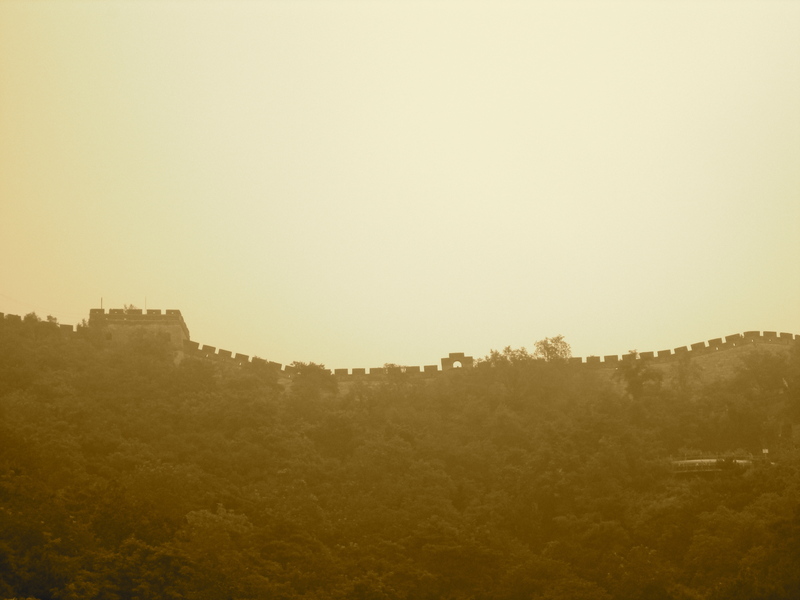 On my second morning in China, I set out for the The Great Wall. After a two-hour ride from the center of Beijing, the bus pulled into a parking lot. It was pretty unremarkable at first; just concrete,a few dozen venders setting up their stalls, and a Subway restaurant. Then I looked up. Through the fog, I could just make out the famous fortress. That’s when it hit me. 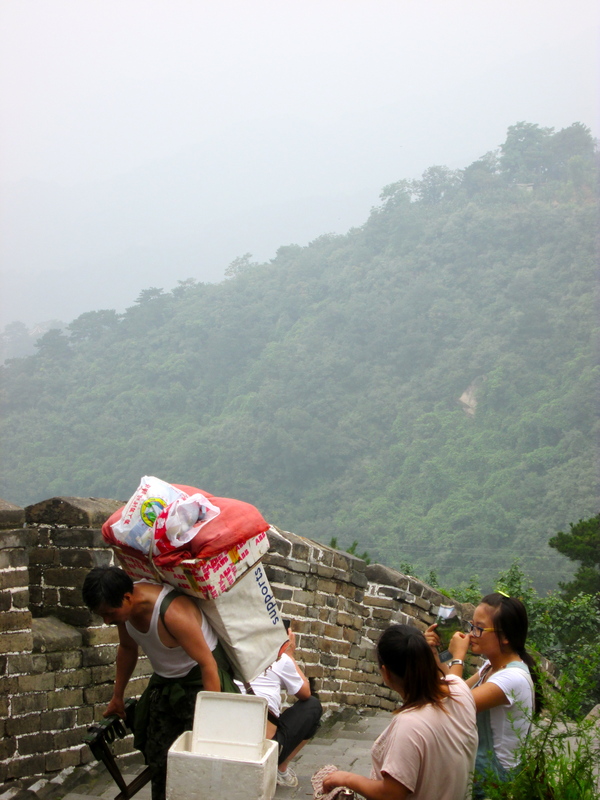 I was actually going to climb the Great Wall. 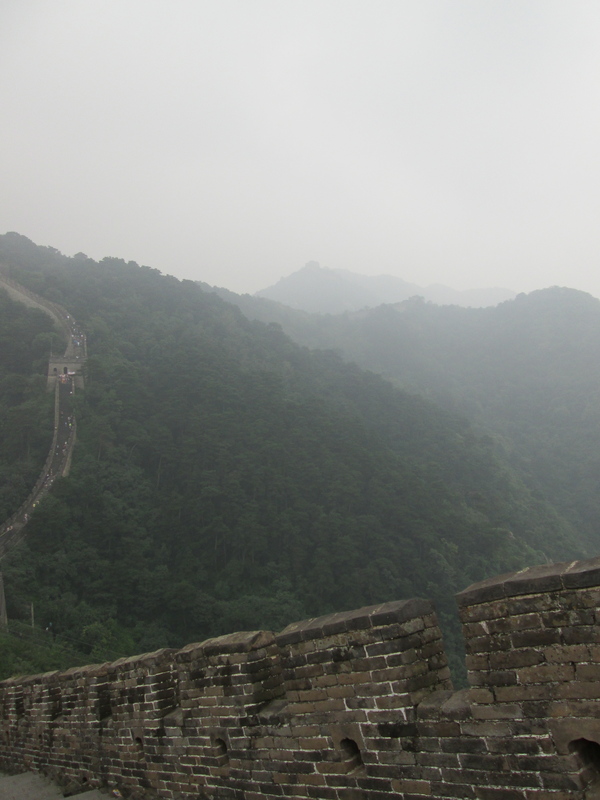 Despite others telling me I would miss out on the “authentic” experience , I bypassed the hour-long hike and took a scenic cable-car ride to the top of the wall. As I reached the platform, two Chinese men leisurely standing around began gesturing wildly. “Sit! Sit!”, they yelled. 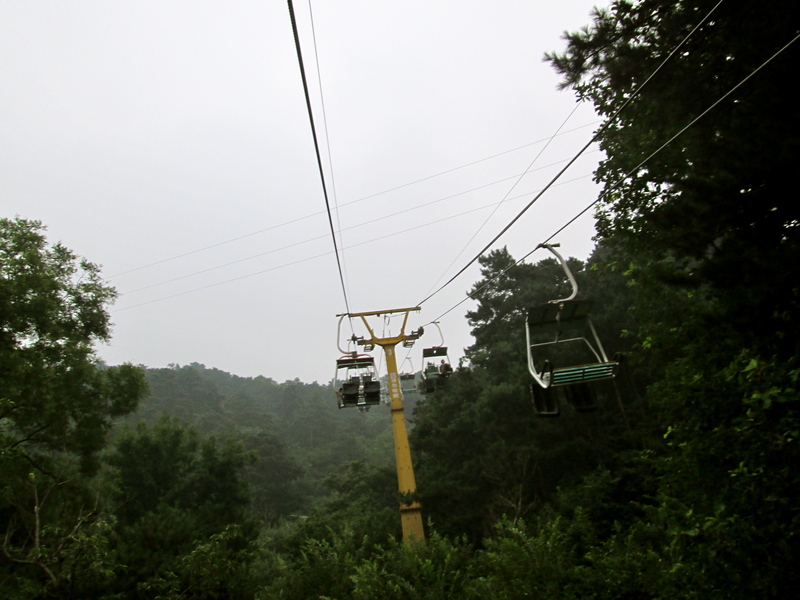 I looked around clueless and then saw the cable car quickly making its way towards me. I sat-or rather, fell-into the seat just in time. The safety harnessed snapped into place and in seconds, I was flying over lush, dense forestry and getting closer and closer to the wall. Now I could just make out the watchtowers and the sparse Chinese flags placed randomly around them. Finally, I was there. 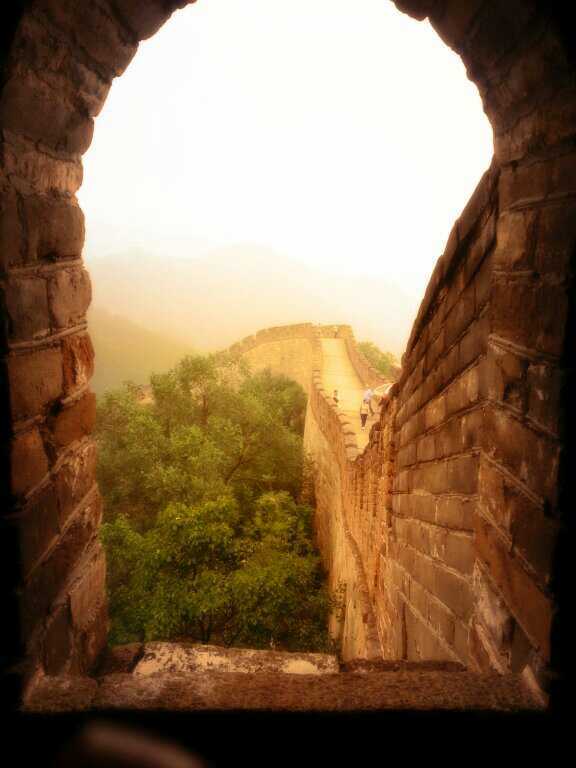 My feet were planted firmly on the ancient Great Wall. Fortunately, there was still plenty of it left to climb. 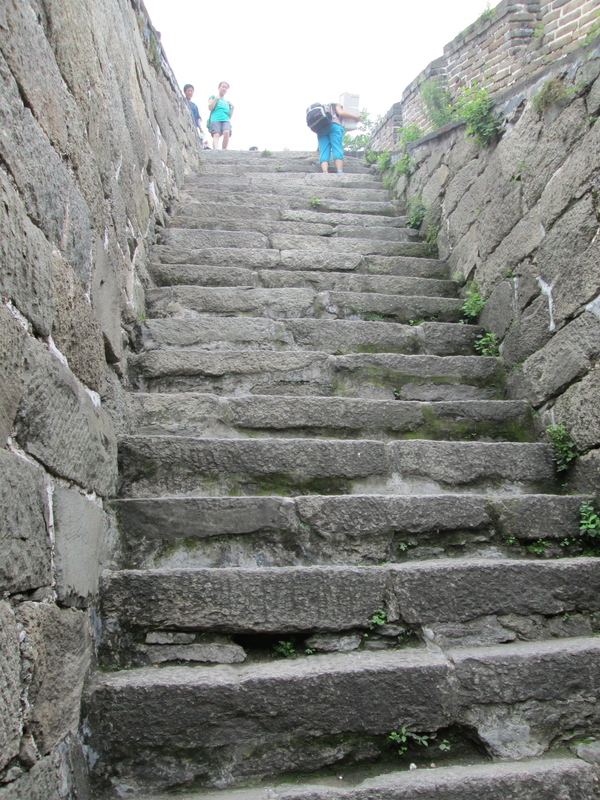 Even after reaching the top, it was a strenuous walk up and down the jagged stone steps and many watchtowers. Even though it was overcast and there was a nice breeze, I still ended up drenched in sweat. Some areas were crumbling and others were well -preserved but all of it was steep. So steep that women kicked off their heels and sandals and it wasn’t unusual to see people on all fours. After three hours of wandering, I raced a Toboggan back down. The six-minute ride offered the perfect opportunity to reflect on the history I just experienced and marvel at the beauty of this place one last time. I closed my eyes; tried to imagine what it would have been like to build this wall. Or to be one of its watchful soldiers, running up and down the twisting stairs multiple times a day. And yeah, I’ll admit it – I was singing the Mulan soundtrack in my head. 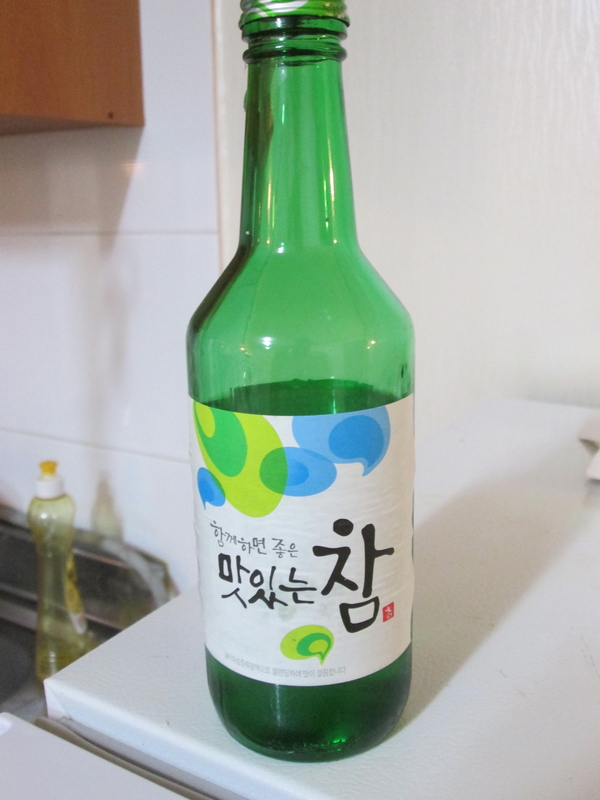 It’s hard to believe thar this week marks my month anniversary in South Korea. Between starting work, finishing up my EPIK orientation, and trying to settle in to a new life I haven’t blogged at all. 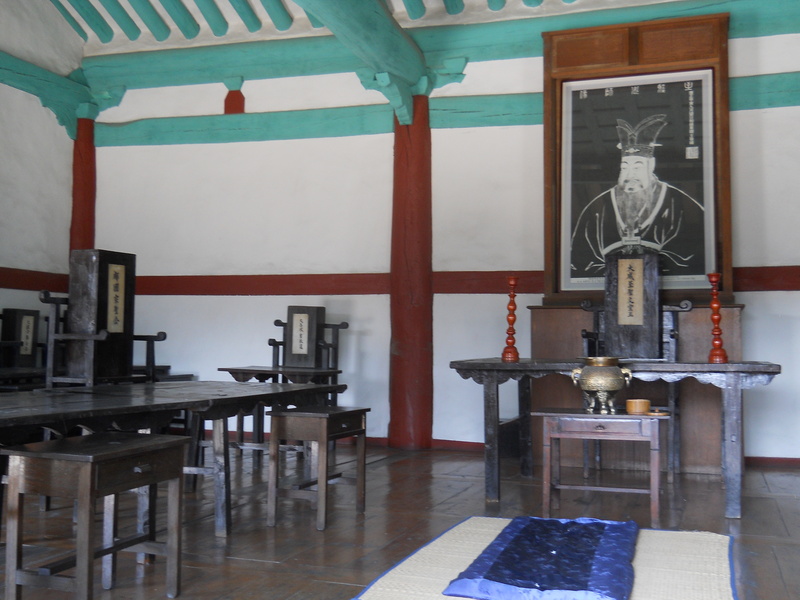 It’s about time I catch up and what better way to start than with my first official outing in South Korea – Jeonju Hanok Village . 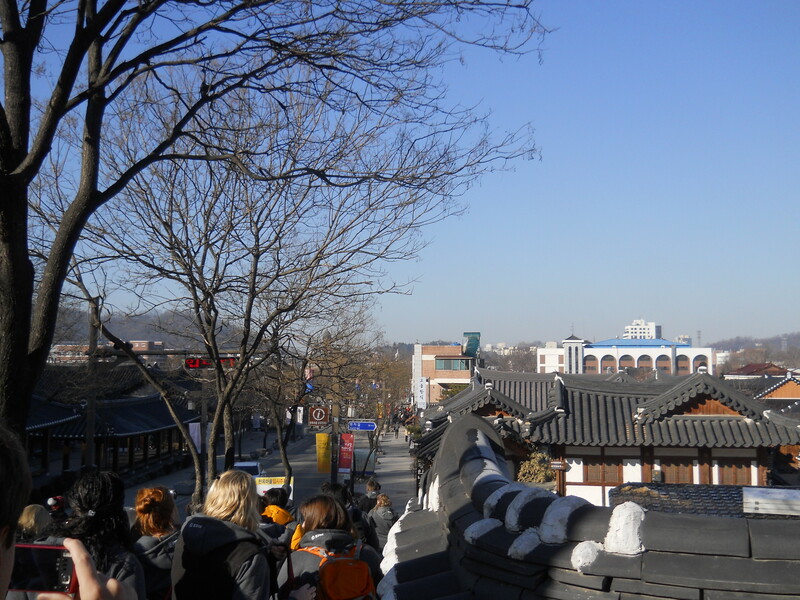 Located in the now developed city of Jeonju, Hanok Village is a well-preserved testament to traditional Korean culture. Along with my orientation group, I started off with a walk through the village that included a stop at a traditional paper factory and store. 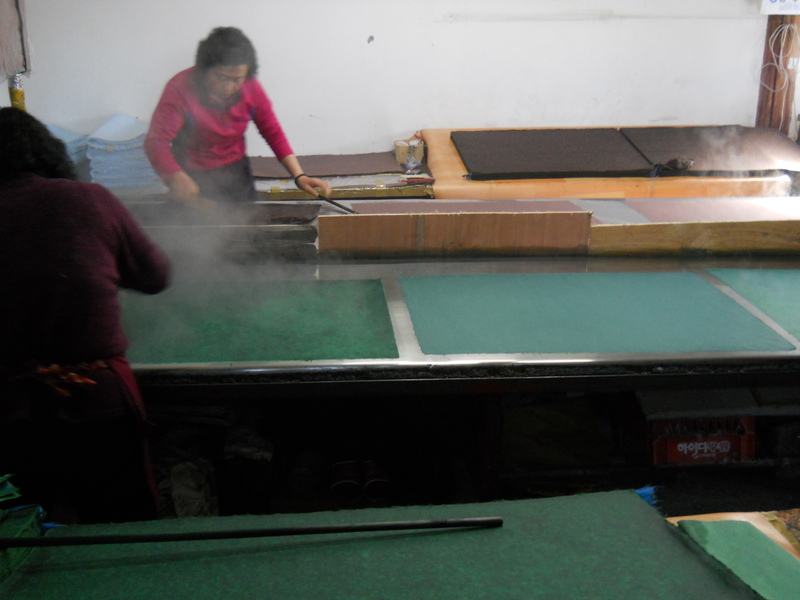 We got to see how the women actually make the paper goods from start to finish. 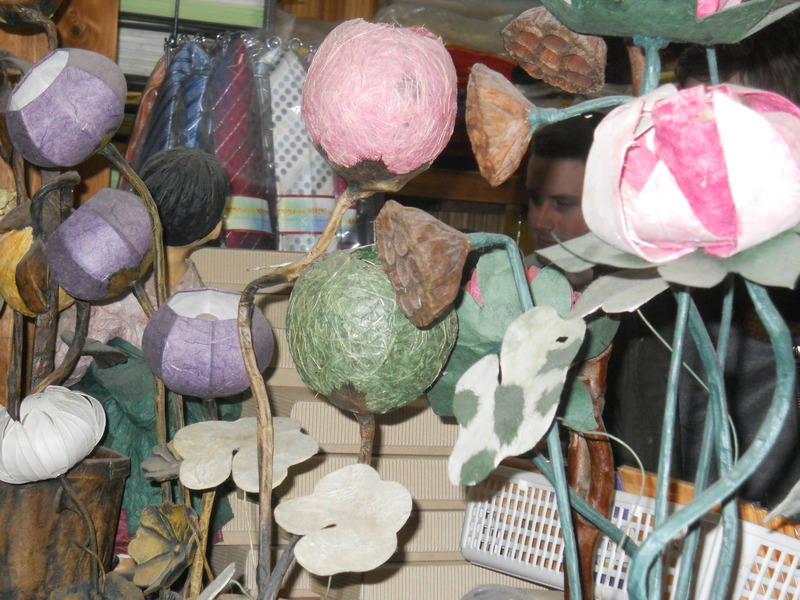 And of course we got to view the finished paper craft products in the near-by store. 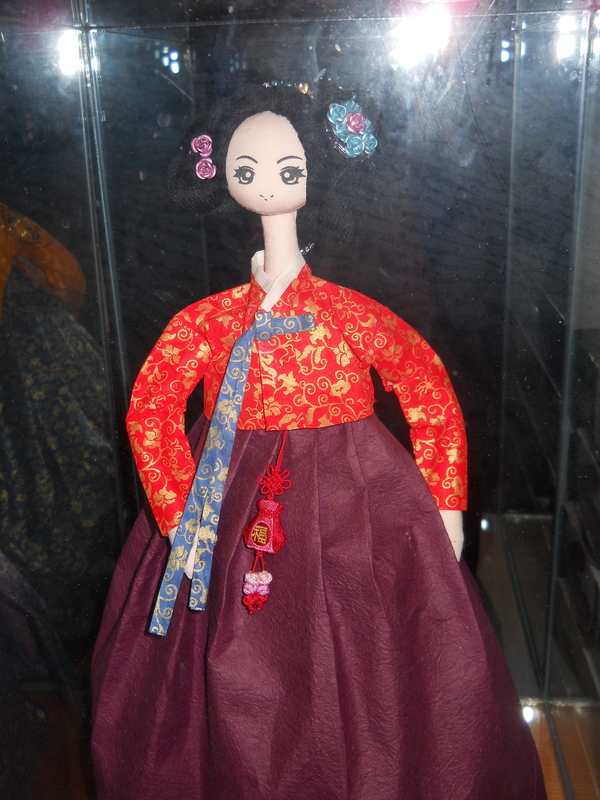 After a sampling of traditional Korean wine, we headed off to view many of the historical buildings in the village. 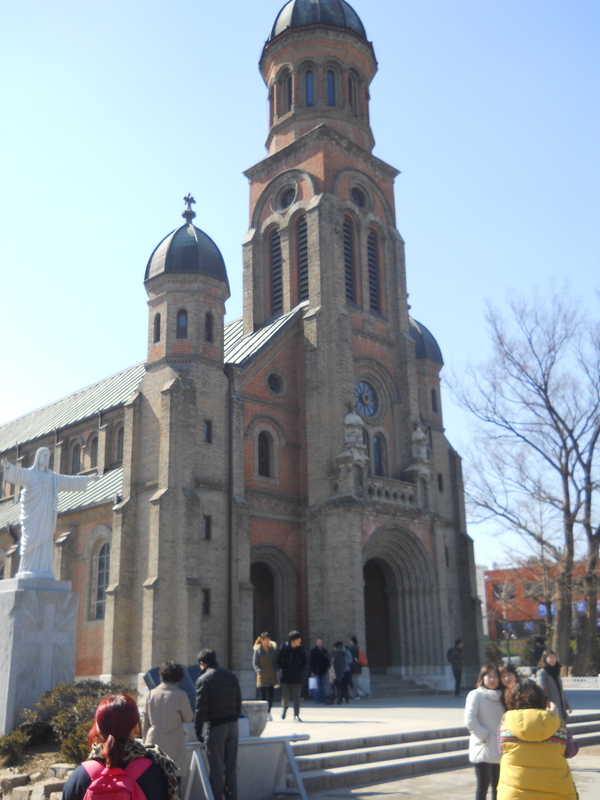 Among these were the first Christian church built in the area, a school-house, and numerous religious sites. 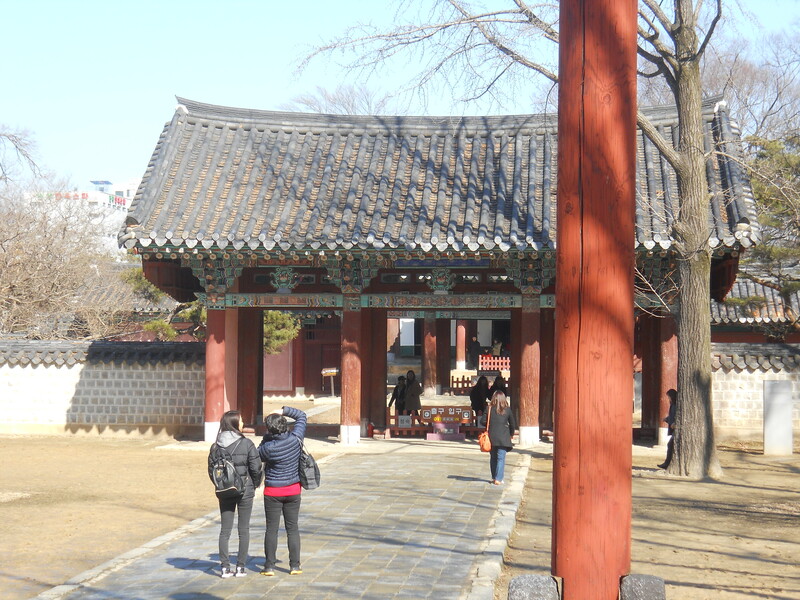 These curved roofs are a signature part of Jeonju Hanok Village. The highlight of the day was lunch. 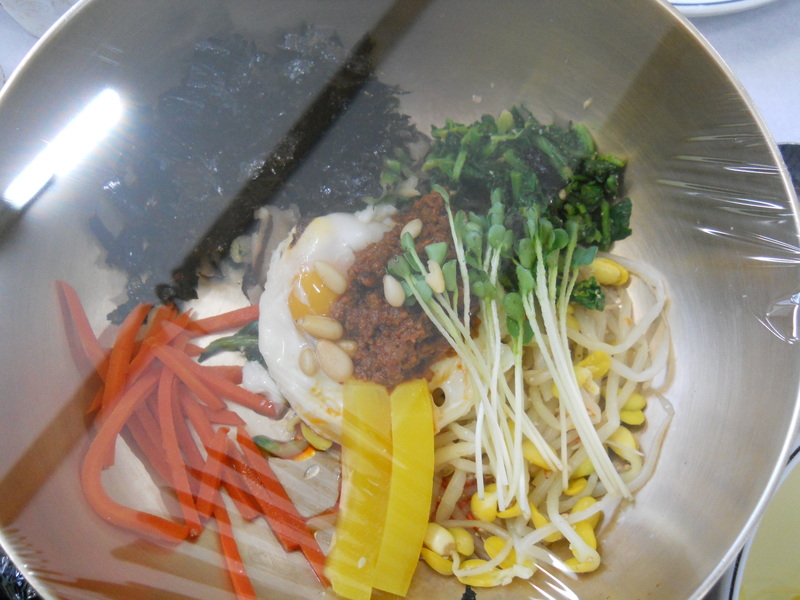 It was my first time getting to try bibimbap. 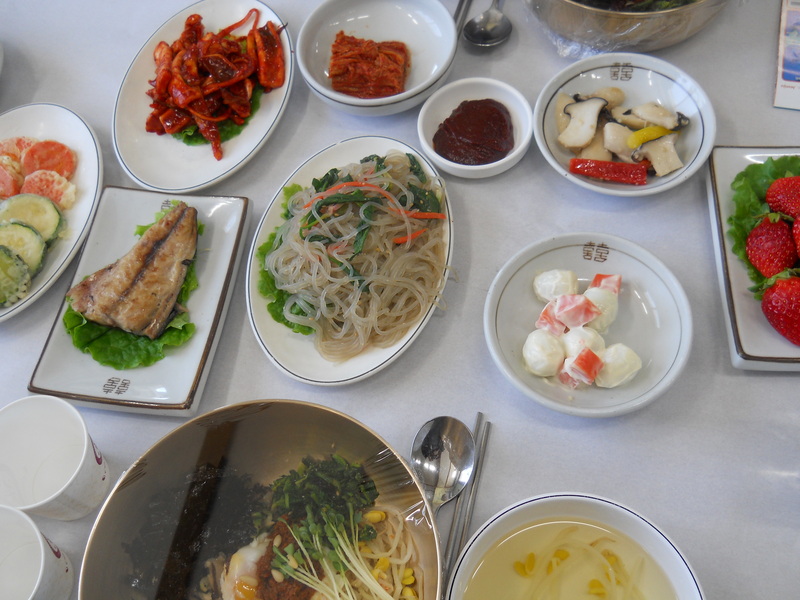 The dish is as traditional as Korean food gets and is one of the main reasons people travel to Jeonju. 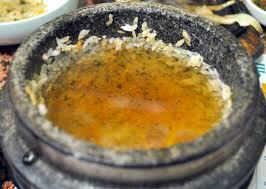 They’re known for making the best bimimbap. I burned off lunch with a quick walk around the neighborhood. 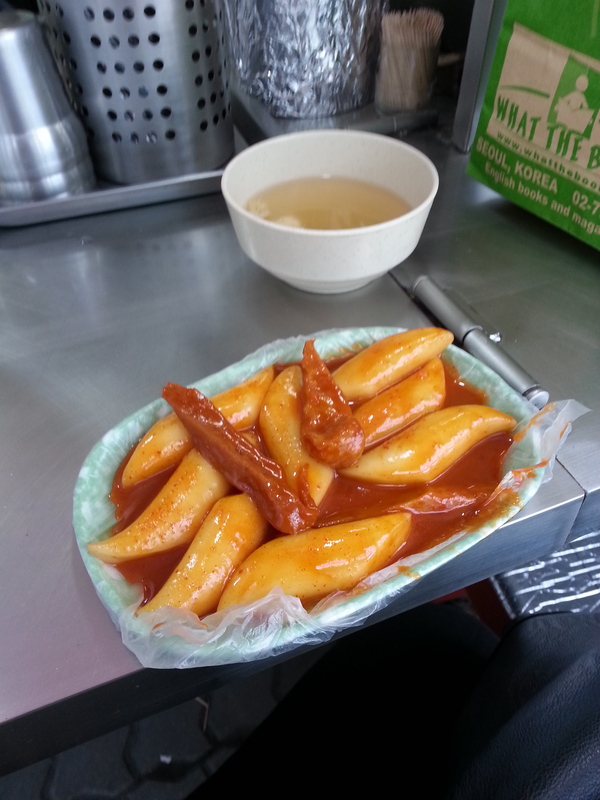 I wondered in and out of more shops, found some intriguing street art, and even more intriguing street food. 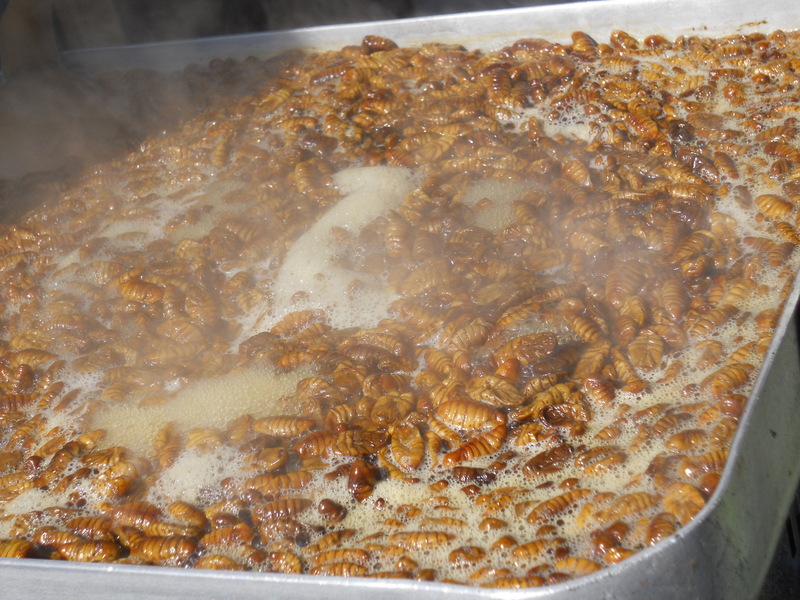 Worthy mentions were hottek ( a pancake filled with brown sugar and served warm) and it’s even more appetizing counterpart–silk worms. 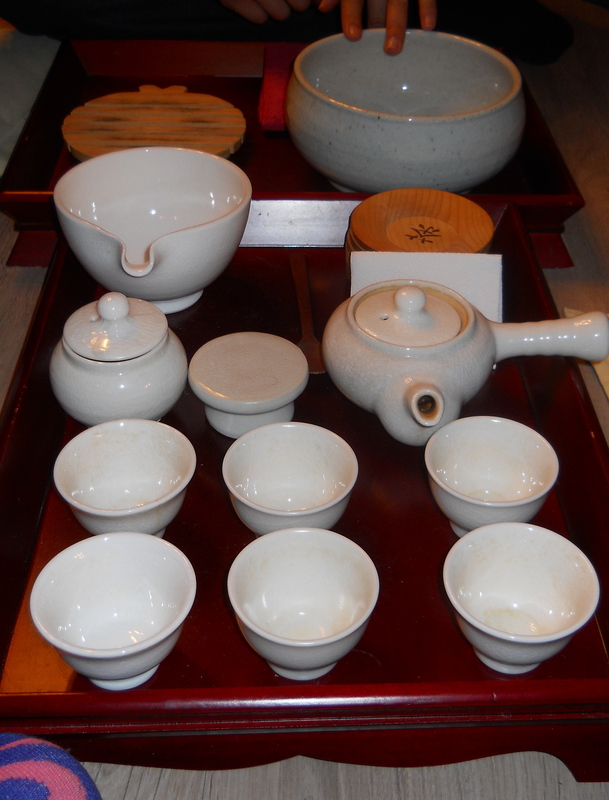 The day ended with a traditional drumming lesson and a tea ceremony , which for me , was the highlight. 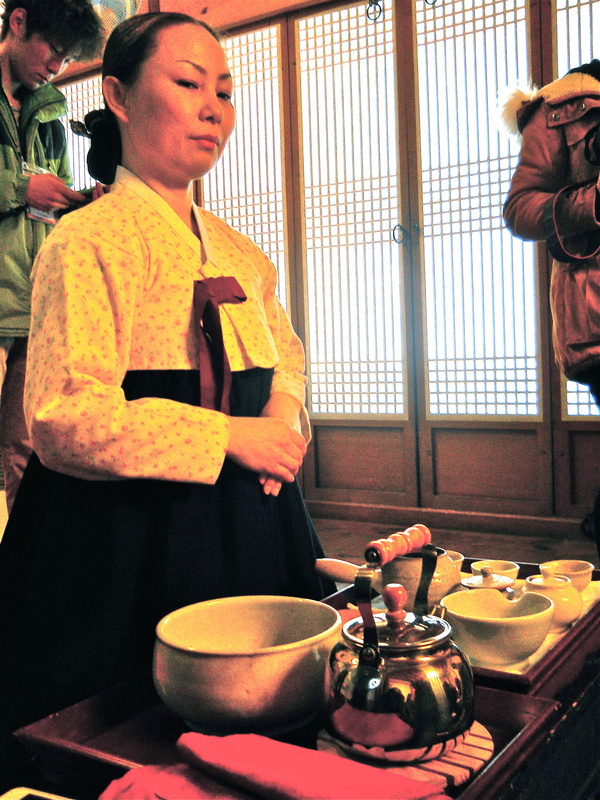 A woman dressed in an extravagant Hanbok(a type of Korean dress) schooled us on the origins of Koreans’ love affair with tea, why green tea is so healthy, and how to properly make and serve a cup. 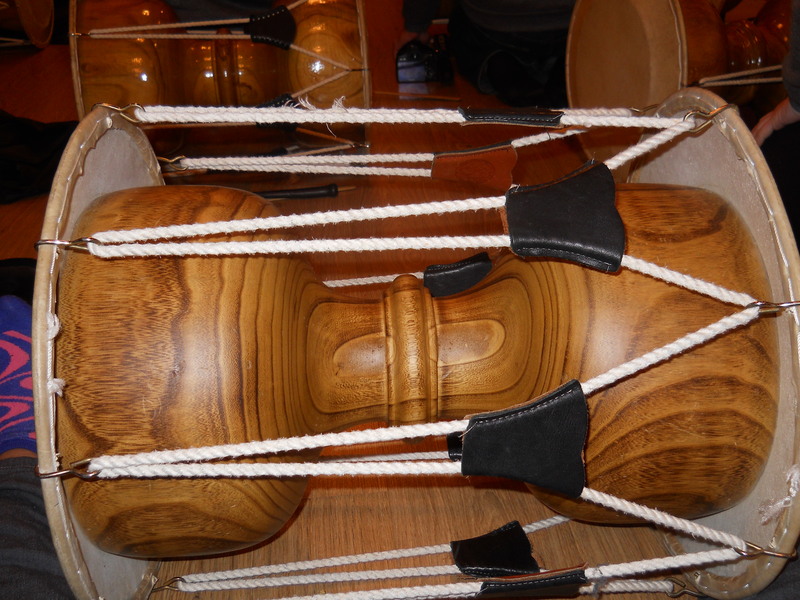 Attempting to play the drums. 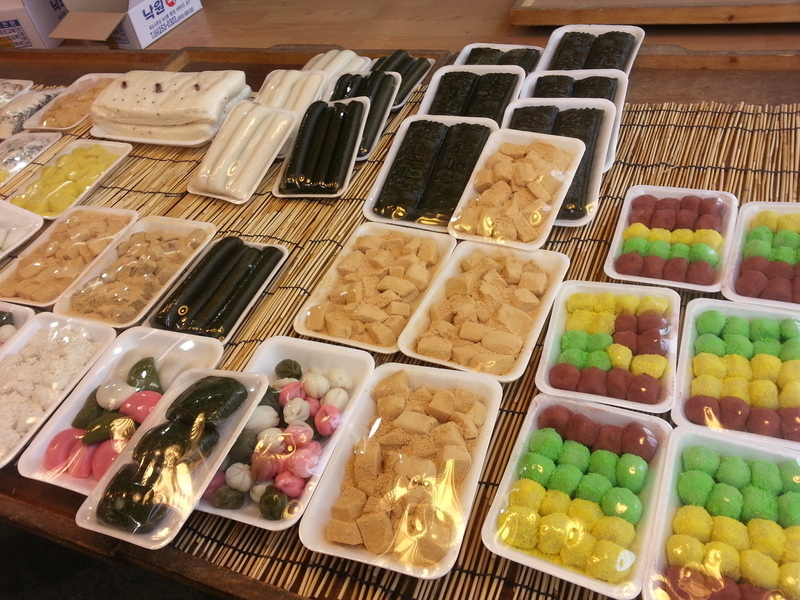 Jeonju Hanok Village offers a lot more than I got to experience. If you’re ever in the area you can try making your own paper crafts, learn to do the dragon dance, and even spend the night in their village’s sleeping accommodations. Blog Awards & The Pink Expat is Moving! I hope the old saying, “Better late than never” still rings true because this post is long, long overdue. I thought the best way to start a new year of blogging is to catch up on old business. So, here is my delayed thanks to those who have gifted me with awards in the past months. The givers probably don’t even remember selecting me for these but it means a lot that people are still reading, commenting, and liking this blog enough to share, even though the posts have been quite sparse lately. 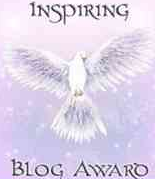 First, the lovely peeps over at Cultfit gave me The Inspiring Blog Award. I was really happy to receive this one, mainly because one of my goals with this blog was to encourage and be encouraged by travel. There are no specific rules for this – which I find refreshing so I will just list a few blogs below that inspire me in some way. 1) The Redhead Chronicles -> Funny and relatable lists, rants, and observations from a follow 20-somehing trying to navigate through life. I initially followed because the author reminded me of my redheaded BFF Nat but I stay for the humor . 2) Write 2 Be -> As a writer/journalist just starting out, I find plenty of advice and encouragement from Ms. Jimmetta . 3) Wholeheartedness -> An endless collection of feel good quotes. Seeing these on my reader makes me smile, even on bad days. 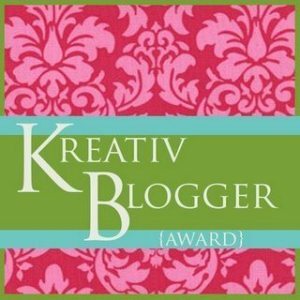 Next up, Snigdha of GetSetAndGo nominated me for Kreativ Blogger Award. I’ve been following her for a while and spent many hours exploring India on her blog. It’s great being noticed by the people you notice. This award asks for 7 interesting facts about 7 nominees and me. 1) Transplanted Tatar -> Good ole’ fashioned travel blog featuring stateside and international destinations. Plenty of great photos to see too. 2) All Around Ana -> I read for the honest & entertaining posts about teaching English in Saudi Arabia. 3) Full Moon Africa -> Great for planning fantasy trips to the mother continent. I added lots of things from this site to my “ to-do” list. 4) Food.Life.Zen -> Gorgeous pictures from a fellow Spain-lover and world traveler. 5) The Harrises of Chicago -> Beautiful photos of international trips as well as their native Chicago. 6) Inside Public Minds -> Well-written and informative commentary on today’s political, social, & other “touchy” issues. 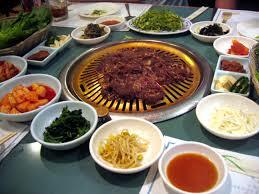 7) For The Intolerants -> There’s a little about everything here: travel, life, food etc. Dedicated to finding the less popular aspects of life. 1) I had a dream and now I want to write a book about aliens. Do I have any knowledge or prior interest about aliens? Nope. But I’m easily inspired. 2) I’m really into mythology. Particularly, the Greek myths and Native American legends. 3) My favorite poet is Langston Hughes. 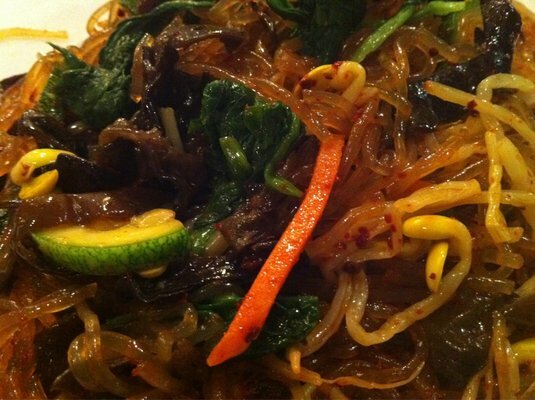 4) I hate the word “Savory”. 5) I’ve been afraid of escalators since getting stuck on one when I was eight years old. 6) My favorite city is London. 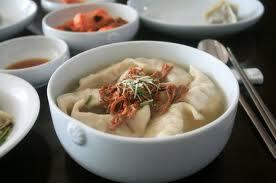 7) I’M MOVING TO SOUTH KOREA! Since coming back from Spain, I’ve been working on a plan to go abroad again. After a long year’s worth of work and several (hundreds) moments of desperation, I finally made it happen. 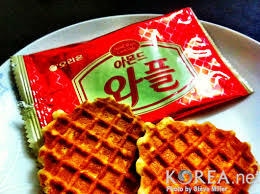 In February, I’m moving to Gyeonbuk, South Korea to teach English as an EPIK teacher. I know there are tons of blogs dedicated to EPIK teachers in South Korea but I could hardly find any about teachers living in Gyeonbuk. Hopefully, I’ll be able to bring you guys some unique posts about places and things you’ve never seen before. I’ve never been to Asia before but as always, I’m down for the adventure. And I can’t wait to share it with you all.